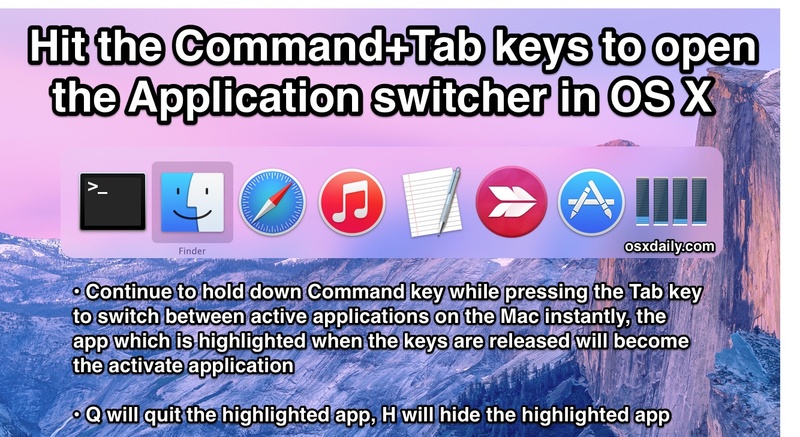 The Command-Tab key sequence in Mac OS X works to summon a quick application switcher, it’s an excellent trick that many advanced users frequently use to switch apps and help multitasking, but it seems lesser known amongst Mac users in general. Even if you know of the Command+Tab trick, it turns out there are many more features available within the Command-Tab application switcher than just hitting Command+Tab itself, in fact you can navigate within the app switcher, hide apps, quit apps, and more. To use the instant application switcher and additional commands, summon the App Switcher as usual and then, once you’re in the application switcher, you can try some of these other modifier key sequences for different behaviors. Even if you can’t memorize them all for now, remembering the three basics is a great place to start to help navigate around your open Mac applications: The core Command+Tab switcher trick, plus Q and H to quit and hide the chosen app, respectively. Memorize these tips to master the Mac application switcher and speed up your workflow! Note: the Expose / Mission Control orientated features will only work on fairly newer versions of OS X, meaning beyond Snow Leopard, but including Mountain Lion, Mavericks, OS X Yosemite, etc. The Application Switcher may look slightly differently dependent on the version of OS X, but it has been around since the beginning of the operating system and will almost certainly carry forward in future versions of Mac OS. If you tab in exposé you can quickly choose between applications with previewing them. Actually, pressing ‘H’ toggles visibility. It can be used to unhide as well as hide. Another way to move the selection to the left is “shitft + tab”. Its more common (imho) because many Tab actions can be reversed by holding down shift. Thanks for the tip, great page! If you select 1 it will do the same thing as selecting up or down, which is great for one-handed operation. Command-Tab doesn’t get much use because it is not very useful. The H toggle for visibility is kludgy and still no support for multiple windows. Try this app. When I do it, it won’t go to my selection. It just stays on the page screen I’m on. Why is that? IMO, the ‘option’ key (bring up application to front, even if docked) should be the DEFAULT. I’m disappointed that it isn’t. I’ve seen numerous Apple publications which don’t even mention the OPTION key and its use when referencing the Command-Tab functionality — including this very website article.